As I wrote about last week, I made the decision recently to keep my handlebar moustache around for a while longer. It had already been my plan to write a blog piece about styling, trimming and maintaining a handlebar moustache, based on my experiences, in honour of Movember this year. When I decided to keep the moustache–as it turned out to be so popular I was all but begged to keep it–it solidified my decision to write this blog piece. Little did I know that I would have so much to say on the subject. In fact, I’m still writing the guide as of this posting. At 2,000 words and counting, The Gentleman’s Guide to the Growth, Styling and Maintenance of a Luxurious Moustache (working title; also possibly Luxurious Moustache: A Gentleman’s Guide to the Growth, Style and Maintenance of a Handlebar Moustache) is too large to publish in a single blog post. 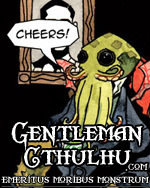 So I have decided to publish the guide in installments. How many installments you ask? I yet have no idea. At this point, I would not be surprised if it took most of the year, and that because it has become such a massive undertaking I may decide to publish the thing in printed form at some point. That said, this week’s first installment is quite wordy. So, without further adieu, I give you the first part of my Handlebar Moustache Guide. There are a few essential items one should have when they decide to become a member of the Gentleman’s Epic Facial Hair Club. Of course, first and foremost, one must have the significant growth of hair necessary to style as they wish (see the section on Growing Your Handlebar Moustache for specifics on how to obtain said growth of hair). Though other than the obvious, there are a few items necessary to obtain when one decides to grow out a luxurious moustache of their own. Second to the comb is a small pair of scissors, otherwise known as hair scissors or even, specifically, moustache scissors. 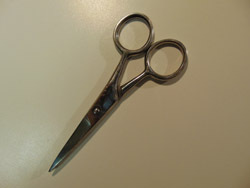 As the name suggests they tend to be considerably smaller in size than the sort a tailor might use for cutting fabrics. Indeed, it is advised that one stay clear of scissors that are too large in size. Bigger is not better in this case. A small, nimble pair of scissors is wonderful for the delicate trimming necessary for keeping one’s moustache neat, and not making a horrid mess of things in the process. More of an optional item in the moustacher’s supply kit, an electric beard and/or moustache trimmer can be quite helpful for maintaining certain styles of handlebar moustaches (or others). This is especially true for those who wish to grow a beard, goatee or other facial hair to accompany their moustache. These devices offer a much less laborious method of cutting or trimming hair than even the most efficient pair of small scissors might. Likely already an item found amongst any gentleman’s toiletries, the razor is a wonderful tool for efficiently removing hair altogether from undesirable places (of course, it is facial hair that this manual is concerned with). A good, clean razor with a sharp blade works best. I have saved this item for the last, only because there is much to say upon the matter. Though it ranks in importance with the scissors and comb, moustache wax is an optional item for the moustached gentleman. Some individuals may wish to style their moustache in a more natural way, combing the hairs and only shaping them slightly with their fingers and a comb. For these men, the purchase of moustache wax is unnecessary. Others, however, will find the item essential to their cabinet of moustache curiosities, and so the following article should be read with care. Surprisingly, not all gentlemen choose to use moustache wax for styling their moustache. Hair products such as hair waxes, gels or even hairsprays have been used by some to hold those wonderful curls which are the hallmark of any handlebar moustache or even the shapes of other luxurious moustaches. Some find these products preferable, and certainly they can be useful in a pinch; however, the author, having been forced to resort to such products when his moustache wax has run out and he wasn’t able to procure a replacement, can say with certainty he has found the results of such substitutes wanting. 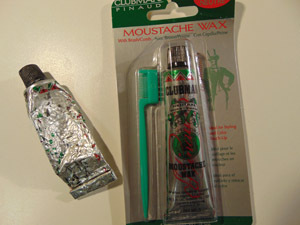 First and foremost, moustache wax is made specifically for the purpose of styling one’s moustache or even beard hairs. After all, the hair upon one’s face is much different than that upon one’s head. It is scientific fact. Androgenic hair (otherwise known as body hair) does not develop until after the maturity of a person, and this hair is of a different consistency, thickness, in some cases length and colour than that which grows on one’s head. Facial hair is a type of androgenic hair, and so it stands to reason that product made for one’s head hair, will not have the precise results upon one’s facial hair. What’s more, the moustache grows in close proximity to one’s mouth, and though it is inadvisable one swallows a tube or canister of moustache wax, the ingredients used in said tonics are less harmful to one’s health if accidentally ingested than those used in products intended for hair which grows at a considerable distance from the mouth. Moustache wax was developed specifically for styling moustaches, and so, it is, in this author’s opinion, the best tool for the job. The case made, the choice of moustache wax is entirely up to the individual and his preferences. There are a number of options out there with varying properties, not much different than hair products will produce different results on one’s head. Some waxes are smooth, others are thick and clumpy. Some remain somewhat wet all day, others harden with limited flexibility. The advice of this author is to try out as many different brands as possible or ask the recommendation of others whose moustaches you admire. The game is to find the brand and consistency that’s right for you. For those curious about my own experiences, I have tried only two moustache waxes myself (and they were very different indeed). As such, I can only comment upon and compare Clubman Moustache Wax and The Art of Shaving Beard and Moustache Wax (by Golddachs of Hungary). Of the two, I find Clubman’s preferable. First and foremost, the Art of Shaving’s wax, while extremely smooth, does not hold the same as Clubman’s. Certainly, fixing your mustache throughout the day is much easier with the Art of Shaving brand. The wax stays wet and can be re-pulled through the hairs at any point in the day. This makes reapplication of the wax much easier, though, admittedly, on a hot day, my moustache would almost drip with wax. On the other hand, Clubman Moustache Wax, though thicker and less smooth to apply, stays where you put it throughout the entire day, and yet remains flexible enough to still be molded even after it dries. What’s more, the firmer hold of Clubman’s brand allows me to shape my handlebar curls into perfect curves. This was near-impossible with The Art of Shaving brand. What’s more, Clubman Moustache Wax is considerably less expensive than The Art of Shaving’s wax. At the time of this writing, Clubman Moustache Wax ranges from the $5.00 to $10.00 range (USD), whilst The Art of Shaving Beard and Moustache Wax is priced at nearly $30.00. Quite a jump in price, especially for a brand I found less impressive to use. But, that is only my opinion. Again, a man’s wax is a matter of personal preference.